The Government of Alberta is planning two upcoming open houses for the Springbank Dam, as part of their public consultation process. All comments, questions and concerns that are submitted, in writing, at the open houses must be noted and included in the Government submissions to regulatory boards upcoming. I would urge and request that you come and attend, and ask as many questions as you can, please write them down to ensure they are actually included in their follow-up notes. Our group has had a chance to review some of the information that will be presented and are left with more unanswered questions and uncertainty. The costs of this project continue to escalate. Not including the thousands of acres required; the road costs, pipeline move or removal, operation costs, and a large number of other costs have been omitted and not been factored into, or in any way updated for this project. This is not going to be fast! A key factor in this decision is the timeline that this option allows (and only potentially 1 year quicker than MC1 because of bypassed regulatory approvals and construction considerations), however the Government has no guarantee of this timeline due to all the factors involving the acquisition of land and regulatory approval process itself. This project is not approved until after the NRCB hearing, at which time they can deny it and stop it! Despite the Government’s best efforts to make this a non-issue, we are hopeful the regulatory process will unveil and reveal the various objections and issues that do not make SR1 a favourable or viable project. 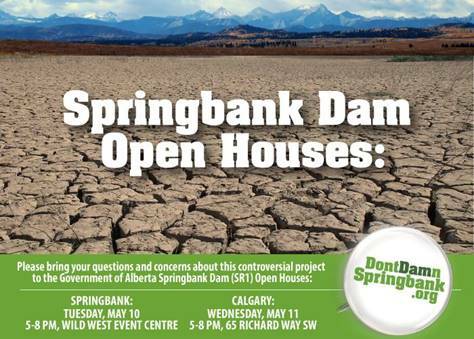 There are two upcoming Government of Alberta Open Houses for the Springbank Dam. Please make time to attend, and voice your concerns about turning the community of Springbank into a dry dam when there are much better options that protect more people. PLEASE SHARE and we’ll see you there. Thank you for your time and attention to this, it is very much appreciated!